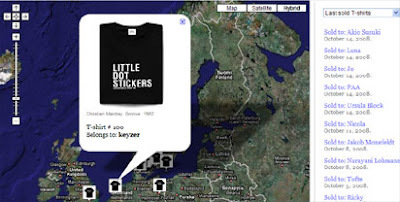 We have seen planes, trains and automobiles tracked on Google Maps but this is the first time anyone has contacted us with a t-shirt tracker. Social Souvenir is a concept based on 300 t-shirts that have been exhibited and put on sale at the Museum of Contemporary Art in Roskilde, Denmark. Each T-shirt is imprinted with a text fragment inspired by 15 renowned artists represented in the museum's collection, such as Yoko Ono, Erik Satie, Marcel Duchamp and Per Højholt. When visitors buy a t-shirt they must share their name and address with the museum. That information is then automatically tagged on Google Maps, thereby making it possible to see where each T-shirt ends up after leaving the museum. During the course of the exhibition, the 300 t-shirts will gradually disappear from the physical museum space and will reappear virtually on the web.